Welcome to the first edition of our Real World Economics Round-up. Each month, we’ll send you a collection of articles from Dollars & Sense and some of our favorite outlets, delivering left economic perspectives right to your inbox! The year of 2019 marks a consolidation of the steady slither into extreme right-wing rule in Brazil, as long-time congressman Jair Colsonaro assumed the presidency on January 1. Read more here. This interview with Robert Pollin traces the linkages between economic growth and fossil fuel consumption, while also highlighting the importance of raising awareness of the climate stabilization project. Read more here. With the sixth anniversary approaching of the Rana Plaza building collapse that killed over 1,000 workers, conditions in the world’s second largest garment export industry are tumultuous. Read more here. The federal minimum wage was established in 1938, as part of the Fair Labor Standards Act (FLSA), to help ensure that all work would be fairly rewarded and that regular employment would provide a decent quality of life. Read more here. I know nothing about motorcycles, and not much more about the U.S. Federal Reserve system–yet I feel compelled to dismantle, pick apart, and understand the latter for the simple reason that it seems to be a machine I’ve been riding on (and vaguely writing essays about) for some time now. Read more here. Click here to receive the next issue of the Real World Economics Round-up. I recently received my November/December issue of our comrade publication Current Affairs in the mail (with the witty caption “Our Latest Issue … By Far” at the top of the front cover), so we don’t feel quite so bad that D&S print subscribers were receiving their copies of our January/February issue around the same time. Solidarity with Current Affairs as we both try to get back on schedule! 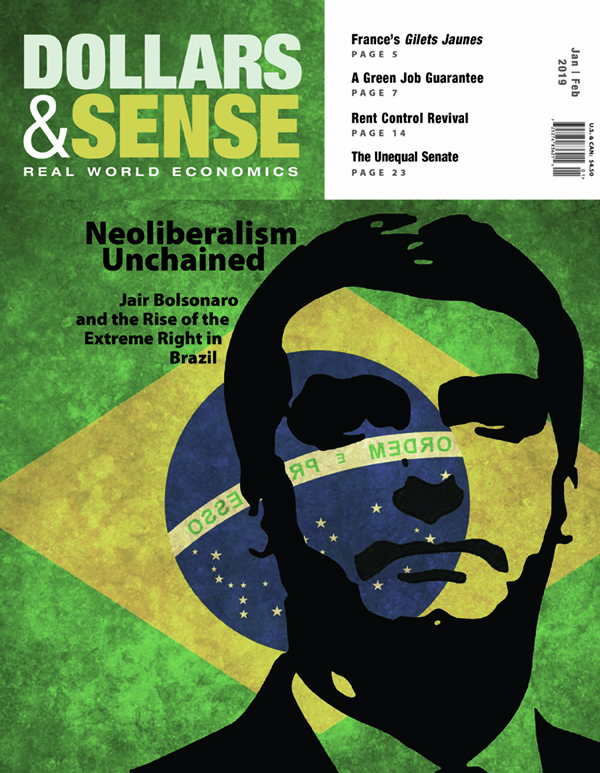 We just posted our columnist John Miller’s latest, A Green Job Guarantee, and we posted Jim Cypher’s cover story, Neoliberalism Unchained: Jair Bolsonaro and the Rise of the Extreme Right in Brazil on January 31st. Brazil had hoped to “unveil its new face to foreign capital,” as Glenn Greenwald of The Intercept put it, at this year’s World Economic Forum in Davos, Switzerland. But the country’s far-right incoming president, Jair Bolsonaro, had to cancel a press conference with his top ministers, including “Chicago Boy” economist Paulo Guedes, in order to avoid questions from the media about an unfolding scandal involving suspicious deposits into the bank account of one of Bolsonaro’s sons. How did this situation in Brazil come to pass? In his cover story for this issue, economist James M. Cypher explains Brazil’s “steady slither into extreme right-wing rule,” and the brand of corrupt neoliberalism it will usher in. Brazil’s oligarchs, led by big agribusiness’ Bancada Ruralista (rural caucus), were behind the right’s coup against Dilma Rousseff of the Partido dos Trabalhadores (Workers’ Party) and its people-friendly “neo-developmentalism.” Bolsonaro, who has praised the military dictatorship that ruled the country from 1965 to 1985, promises a brutal neoliberal regime that will allow international capital to plunder and despoil the Amazon. Meanwhile, Trump has had kind words for Bolsonaro, and the two have teamed up to signal support for a coup in Venezuela. In this issue we also address the rise of the right in the United States. Jerry Friedman’s Economy in Numbers reveals that the unequal—and unrepresentative—U.S. Senate is one key factor. The U.S. Constitution’s guarantee that every state, regardless of population, will have two senators gives disproportionate representation to rural areas over urban, gives white voters more clout than non-white voters, and favors conservatives over liberals. All of this has favored Trump and the GOP, but it is deeply undemocratic and will be hard to change. But we do offer some rays of hope in this issue: an article on the gilets jaunes and their resistance to rising inequality in France; a feature on the revival of rent control in the United States, and how mainstream economics gets it wrong about rental housing markets; John Miller’s column on how a federal job guarantee could help create green jobs; and more. With this issue we kick off our 45th anniversary year! Our official 45th anniversary issue will be in November/December, but for each issue this year we will include a reprint of an article from the D&S archives. On p. 27 we have an article on work stoppages from the January 1975 issue—timely given the L.A. teachers’ strike (which recently ended in victory for the teachers), the wave of teachers’ strikes last year (see Ellen David Friedman’s “What’s Behind the Teachers’ Strikes,” D&S, May/June 2018), and the role that slowdowns, “sick-ins,” and threats of a general strike by flight attendants, air traffic controllers, and TSA agents appear to have played in ending Trump’s government shutdown. While it feels as if there’s an upswing in strikes and labor militancy, reading the piece from 1975 is a good reminder of how many fewer strikes there are these days than there were when D&S was founded. According to data from the Bureau of Labor Statistics (BLS), there were just seven work stoppages involving 1,000 or more workers in 2017 (the most recent year for which the BLS has data), and those stoppages involved some 25,000 workers total. In contrast, 1974, the year D&S was founded (and the year that this issue’s 45th anniversary reprint focuses on), had 424 work stoppages of 1,000 or more workers—involving a jaw-dropping total of 1,796,000 workers. Keep an eye on these pages and our website in the coming months as we continue to celebrate our 45th anniversary with reflections from readers on the impact of D&S, anniversary events, and a sustainability campaign to support our work for years to come.